In 1916 the Proclamation of the Irish Republic declared the right of the Irish people to the ownership of Ireland and to the unfettered control of Irish destinies. They wanted to realise this in a sovereign, independent Irish democracy that would have the welfare of all the citizens as its guiding principle. This vision has never been achieved, and the Irish people have borne the consequences of this failure. We believe that the 100th anniversary of the Rising presents an opportunity to open a meaningful dialogue among the citizens about the principles of 1916 and how they can be applied to the task of building an Irish democracy in the twenty-first century. In a genuine Republic the people would have full control over their own lives; the common good would be at the centre of decision-making; and all the citizens would reap the benefits of a fully human society. Reclaim the Vision of 1916 intends to organise three national events: a National Parade of Celebration on Sunday 24 April 2016, a national seminar in the spring of 2016, and a significant publication. It is hoped that many individuals and groups throughout the country will affiliate to the Initiative and participate in the national events, as well as organising their own activities. We invite those who are interested in joining us in this project to contact us now, and we wish to co-operate with those who share our concerns and are organising their own events. The Citizens’ Initiative has set out its ideas and aspirations in a Proclamation for a New Irish Republic, together with a Political Statement. Alongside the programme outlined above we want to encourage wide discussion and debate about the ideas contained in these documents. We affirm that the only solution to this failure and crisis will be found in a sovereign, independent Irish democracy that puts the common good at the heart of government and where sovereignty rests with the people and democratic power is exercised by them. We want Ireland to develop a culture that fosters and encourages independence of thinking and action. We recognise that there may be differences between us about how our vision can be implemented, but we insist that everyone who believes in the democratic right of the people to govern themselves should support our shared struggle for a better society for all. In such a democracy, the common good would come before the freedom of capital and the markets or the pursuit of private profit. The wealth of the country belongs to the people, and the natural resources, industries and services must be utilised in the interests of all the people and subjected to their democratic control. 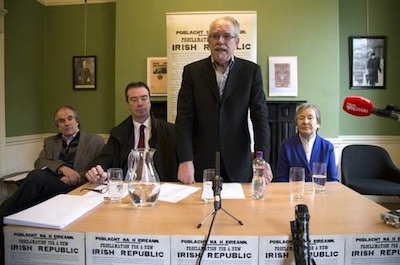 At the end of this initiative we hope there will be a deeper understanding of the need for a real Irish democracy and what that would mean, and that as many people as possible will have been drawn into the circle of discussion, thinking, and participation. Reclaim the Vision of 1916--A Citizens’ Initiative for 2016 will be officially launched at a public rally in Dublin at Easter 2015. We will be contacting the widest range of individuals and groups to discuss these ideas and to see how we can work together to ensure that the centenary of the 1916 Rising is properly celebrated.